Say hello to these bright flower cupcakes. From top right: colored coconut, colored sprinkles and colored decorating sugar. Photo courtesy McCormick. This is Page 4 of a five-page article. Click on the black links below to visit other pages. These flower-topped cupcakes are a festive way to finish off your brunch. This recipe is from decorating experts Karen Tack and Alan Richardson, co-authors of the book, What’s New, Cupcake? Recipe yields 24 cupcakes. Place white sprinkles, white decorating sugar or coconut in large resealable plastic bag. Add food color. For 1 cup sprinkles, add 1/4 to 1/2 teaspoon food color. For 1 cup sugar, add 1/2 to 1 teaspoon food color. For 1 cup coconut, add 1/4 teaspoon food color. Seal bag. Knead sprinkles, sugar or coconut until the color is evenly distributed. Add additional drops of food color for a darker shade. Spread colored sprinkles, sugar or coconut on large rimmed baking sheet. Let stand 15 to 30 minutes or until dried. Store in airtight container. Place colored sprinkles, sugar or coconut in small bowl. Cut 30 marshmallows crosswise into 4 slices with sharp scissors. Press the cut side of each marshmallow piece into colored sprinkles to coat. Place coated side up on baking sheet. Repeat with remaining marshmallows and sprinkles to makes 120 marshmallow petals. Tint the frosting bright green, using 1/2 teaspoon green food color and 4 drops blue food color. Place the green-colored sugar in a shallow bowl. Spread top of each cupcake with green frosting. Roll the edge of each cupcake in green sugar. 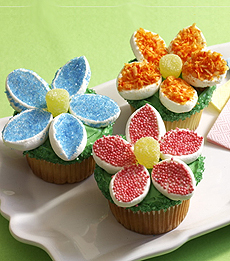 Arrange 5 marshmallow petals on top of each cupcake to resemble a flower, pressing the marshmallows into the frosting. Place a gumdrop in the center of each cupcake to complete the flower.